You’ve seen the places we Socks have been – all above ground, which would be natural, right? Who likes to go underground? Not us! But Stacy Lyn took us to the Catacombs of Paris, and we were obligated to decend into the world of the underground where the remains of countless citizens lay in the afterlife. Creepy, huh? See, the problem is that there is a limited amount of burial space in France. So, after a certain length of time, or if a grave has been abandoned and unclaimed by a family for so long, the remains are disinterred and placed in an ossuary. 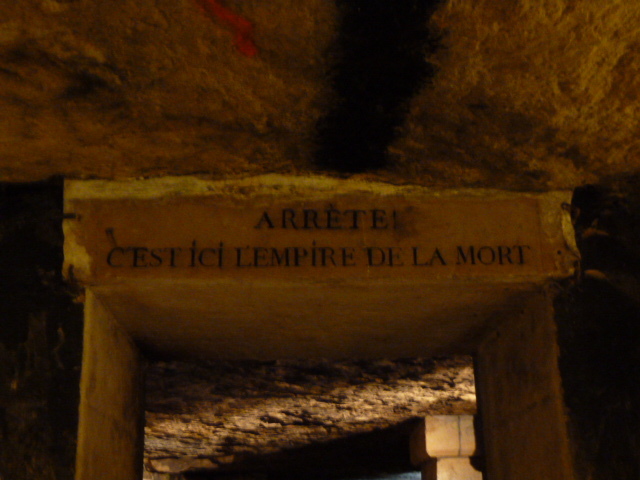 For many years, those remains were brought to the tunnels of underground Paris – the Catacombs. Stacy Lyn took photos of all of the placards with their creepy admonitions about death. For some reason, she was fascinated by the words more than the bones! Great. 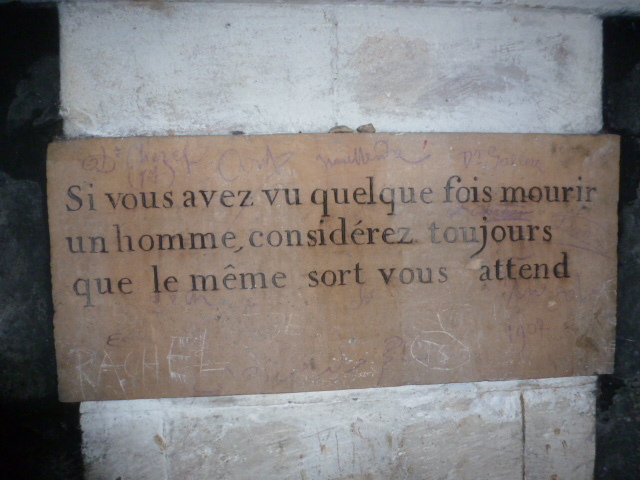 Because You love cemeteries as I also, then You should visit in Paris Père Lachaise Cemetery. I have been there thrice and every time I found something new. that is one brave pair of socks! Sadly, I’ve only spent a couple of nights in Paris and haven’t been able to see the catacombs yet. But they are on my list! That is very creepy, Stacy Lyn! Did you see any ghosts? You are brave for going there!